A popular meme suggests that social media can be ‘explained’ by reducing it to the actions it conveys. Twitter is used to alert friends to the fact that “I’m eating a donut.” Facebook is helpful to let people know that “I like donuts.” The suggestion that our underlying behavior – eating donuts – is unchanged is comforting, but not really true. 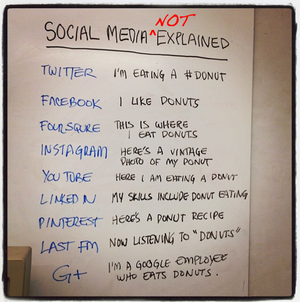 Social media interfaces are profoundly altering just about everything besides the act of chewing: how you find donuts, which donuts you eat, who you eat them with, and et cetera. This is true not just for consumers, but also for individuals at work, who have to do more important things than eat donuts. Trying to keep on top of the proliferating array of gold-rush services is a full time job. Minute tweaks reliably generate reams of analysis – because of the low barriers for publication, the mediascape surrounding social media products has become profoundly captured by manufacturer PR. Discerning utility from hype is an arduous challenge. It wasted time because the important stuff, the conclusions of the chatter, were buried within the chatter; and you had to read through backlogs of crap if you were, say, at a meeting for a couple of hours. Also, we couldn’t find a way to attach documents, etc. We didn’t use it for that long. The more ridiculous issue is, of course, that we’re all sitting within literally 30 or 40 feet of one another. Whether a given utility is actually useful for your working group is another problem still. This report sets out to discover the best methodologies used for making the right decisions about which internal communications platforms to use. What we discovered is that successful companies don’t chase hype, don’t blindly use the most popular products, but carefully choose the solutions that prioritize the employee thought-operations that are most necessary for their organization’s triumph. They are also, sometimes, reorganizing their companies to better maximize new employment structures that have been made possible by technology. Smaller organizations especially have grown to become reliant upon distributed networks of freelancers with talents that can be activated on demand. 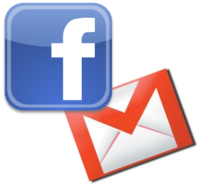 Are email and social media complementary channels? More companies and agencies view email marketing and social media as complementary channels, though the majority view the two as separate activities. For our Email Marketing Census 2012, produced in association with Adestra, we asked 846 company and supply side respondents about their views on the relationship between email marketing and social media. While some still believe that social media means the death or decline of email, there is a growing belief that the two channels can work together. Here are some stats from the survey which look at how brands are using email to drive social media activity, which tactics are working, and what is holding them back. Independent TV production company All3Media has launched a new connected TV app that will allow viewers to rent its archived shows. If it proves to be a success, this could be a new way for production companies to monetise their content. The app will make over 230 hours of content available to rent for a 48 hour period, and includes programmes like Skins, The Only Way Is Essex, Midsomer Murders and Peep Show.